The energy sector around the world works on a monthly cycle. The Trans Mountain Pipeline is part of that cycle. Apportionment describes the amount of demand shippers place on the pipeline in excess of its available capacity. Here is a step-by-step guide to the apportionment determination that is carried out every month for the existing Trans Mountain Pipeline system. 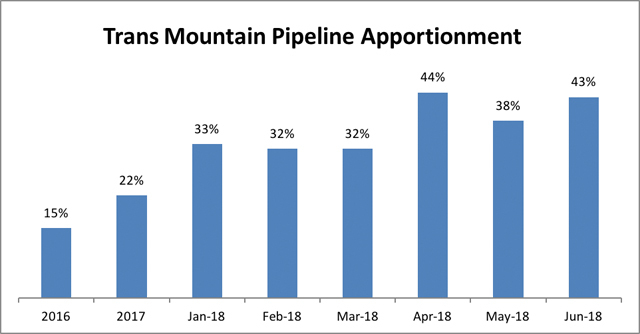 Each month, Trans Mountain’s shippers submit requests for how much petroleum (crude oil and refined products) they want to ship through the pipeline to service their customers. These requests are called ‘nominations’. Based on shippers’ nominations, Trans Mountain then determine the ‘capacity’ available on the pipeline for the month. Determining pipeline capacity is complex. Capacity is affected by, among other things, the types of products that have been nominated, any pipeline system maintenance activities that will reduce flows that month and carry-over volumes that have not completed their transit of the pipeline by month’s end. Based on available pipeline capacity and the volume of shipper nominations received, Trans Mountain calculate apportionment using a method accepted by the National Energy Board and forming part of its tariff. A tariff includes the terms and conditions under which the service of a pipeline is offered or provided, including the tolls, the rules and regulations, and the practices relating to specific services. If shipper nominations are less than pipeline capacity, the apportionment percentage to that destination is ‘zero’ and all the product volumes nominated by shippers are accepted to be transported that month. Apportionment of the Trans Mountain Pipeline system has been a regular monthly occurrence for the past decade. The chart shows the average levels of apportionment for 2016, 2017 and the first five months of 2018. When a pipeline experiences significant and prolonged apportionment like in the case of the existing Trans Mountain Pipeline, it is one signal that more capacity is needed. Apportionment can bring with it a discounting of prices as producers compete to sell what they can through the pipeline before having to use another pipeline or other modes of transport to another, less profitable market. It can also mean the buyers at the end of the pipeline are forced to source their shortfall of supply from alternate, less desirable sources. There is a strong and clear business case supporting the Trans Mountain Expansion Project. Trans Mountain shippers have made long-term contract commitments ranging from 15 to 20 years that will underpin the cost of construction and the operating costs. The additional capacity offered by the expansion will be used to supply more crude oil and refined products markets in British Columbia and Washington State and to offshore markets in the Asia Pacific. Pipeline design and operations, including emergency response and preparedness for tanker movements are world-class, providing a safe and reliable supply of petroleum products to the markets served by the Trans Mountain Pipeline.